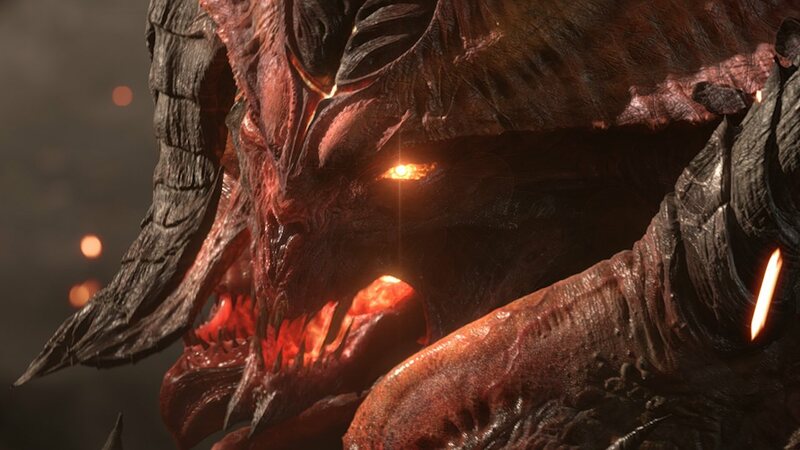 “Sweet dreams.” The flick of a Diablo-themed light switch had been more than enough to ignite a maelstrom of excitement online, sparking a shred of hope that Blizzard Entertainment’s award-winning action RPG was mercilessly carving a path through the demonic hordes to the Nintendo Switch. That happened way back in February, and, while the developer had pleaded ignorance at the time, we would eventually learn six months down the line that Diablo III Eternal Collection was indeed destined for the portable home console. And now, set to release to coincide with BlizzCon 2018 next week, I had the chance to team up with three other players to spend two hours slaughtering the demons that have infested Sanctuary. As with any action RPG, the immediate decision that you are faced with is which class to pick. Diablo III Eternal Collection (which includes the original Diablo III, the Reaper of Souls expansion and the Rise of the Necromancer pack) has seven to choose between, catering to different play styles while feeling perfectly balanced to work in tandem with one another. There’s the Barbarian, a stoic warrior that towers above other warriors and crushes their enemies in close quarters, the Witch Doctor who can manipulate the forces of life and death to summon creatures from beyond the grave, or the Monk that relies on martial arts to pummel their foes with the chance to use holy and elemental magic. The Wizard uses temporal and elemental energies to cast protective shields and fling spells in an enemy’s direction, the Crusader is a religious warrior that’s committed to expelling evil from the world by crushing them with a hammer, and the Necromancer who, as you would probably expect, can summon undead minions to command or revive felled enemies. If you glossed over that paragraph, then at least know that Diablo III Eternal Collection lets you play how you want to without shoehorning you into an unwanted role that you must play in the battles to come. Every character can glug a health potion when needed, meaning that no one is landed with the tense responsibility of keeping your party alive. Sure, the classes are split between those that swing their sharpened weapons in an enemy’s face and can soak up damage, compared to those that are slightly more vulnerable but can devastate enemies from afar. But, even when an unexpected attack brings your character to their knees mid-battle, you can quickly respawn and leap back into combat to fight back. I chose to play as the Demon Hunter who can temporarily slow enemies with traps and deals damage from a safe distance thanks to a reliance on ranged weaponry like bows or dual-wielding crossbows. Your character starts at Level 1 and (after we had all opened the cosmetic items menu to summon our Cucco companion pets) we set out to investigate the disturbances that we had gleaned from NPCs. Given the time constraints, I didn’t get to read (or hear) as much of the unravelling story as I would have liked, but that’s something that I will soon have the chance to upon release. It wasn’t long before we were thrust into combat, instances where you will come to rely on your character’s skills to deal damage and keep you out of harm’s way. These are easy to perform seeing as they are mapped to different controller buttons, and you will steadily unlock more as you level up, which, early on, takes no time at all. Hungering Arrow let me fire a magically imbued arrow, I flung daggers at my enemies with Impale and used Caltrops to inflict Slow to keep foes at a distance. The evasive skill Vault made me laugh as my character would cartwheel out of danger, while Fan of Knives was the most potent move that I eventually had access to. I think I was around Level 15 by the time our two-hour session ended, and, with the climb to the Level 70 cap to continue beyond that, you will eventually have access to many skills that you can use to play around with different builds. You will also come to rely on Loot to strengthen your character. While merchants and blacksmiths will sell you more devastating weapons and sturdier armour for a price, there’s a chance that the monstrous demons and ambling undead that you slay will drop rewards once vanquished. This helps to maintain a sense of constant progression. Not only is your character levelling to unlock new skills to play around with, but new armour will make them hardened for their perilous adventures while more powerful weapons will increasingly make your attacks more devastating. Seeing as the game has already been ported to PlayStation 3, Xbox 360, PlayStation 4 and Xbox One, it came as no surprise that the experience translates so well to a controller. Switching through menus was snappy, and radial wheels made making selections all the easier. I’m sure that won’t convince PC purists by any means, but I think that it’s important to mention that swapping out a mouse and keyboard for the Joy-Con (or Nintendo Switch Pro Controller) won’t hinder your dungeon-crawling efforts. We know how Diablo III Eternal Collection runs on Nintendo Switch whether you choose to play in TV mode (960p 60FPS) or Handheld mode (720p 60FPS), and, having now seen it in action for two hours, it’s hard to find anything to complain about. Sure, in comparison to beefier hardware it’s clear that the visuals won’t be able to directly compete, but I’ll leave others to make those graphics comparisons. What we’re left with is what, so far, looks to be an impressive technical feat that Blizzard has achieved on the plucky portable home console. That can even be seen in the many ways that you can team up in multiplayer. Whether with single Joy-Con, Joy-Con pairs or a Nintendo Switch Pro Controller, your options are either to play locally on the same Nintendo Switch, link four consoles together wirelessly or play online (which will require a Nintendo Switch Online service subscription). In that sense, despite first hitting PC six years ago it’s hard not to see how perfect a match Diablo III Eternal Collection is for the console and, hopefully, those reading this will feel the same. As a newcomer to Diablo’s world, it was exciting to have the chance to take my first steps in Sanctuary. It’s a world steeped in lore that, with my Cucco companion pet loyally following behind me, I can’t wait to explore its every nook and cranny. Now, I just need to find three players to crush demons with. Are you in? Diablo III Eternal Collection will release for Nintendo Switch worldwide on November 2nd and is now available to pre-load on the Nintendo eShop.